Friday is here and all is right in the world! Lots of updates today, but not many pictures. Fail, I know. They are also probably ones that I find way more exciting than you do, but hey you'll love me anyways right? And you're all like, "actually, no..."
+Let's start with the coolest of them all! 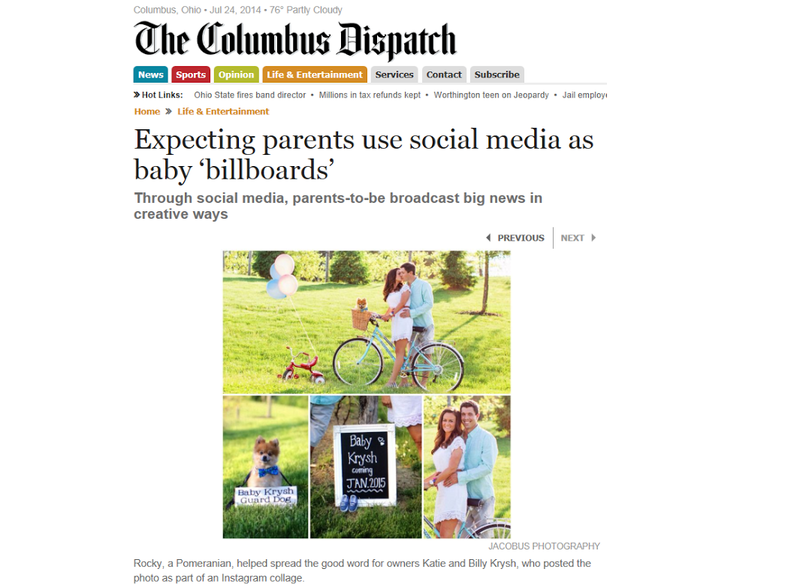 Rocky and Baby K made the The Columbus Dispatch and we were on the local news yesterday! 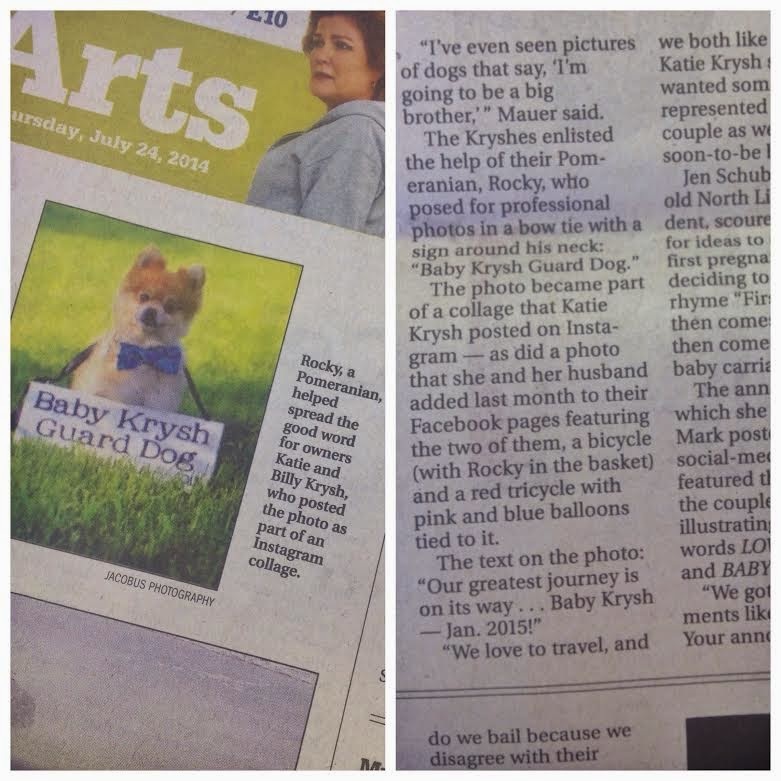 A few weeks ago, I was interviewed by a reporter from our newspaper who wanted to use our photos and the article was about creative ways to announce your pregnancy. It was so cool/hilarious to open up the paper and see Rocky right there front and center...I always knew he'd make it as a dog model! BOO, who?! ;) I actually didn't know we would be on the news, but a girlfriend (hi Ashley if you're reading!) texted me at 6:30am saying she saw our pictures on it. I'm mainly excited about all this just to keep the article and show our baby one day! Famous in the womb...or something like that. +We bought a new four piece patio set! WAHOO! Another task accomplished off our list. It was 50% off so I couldn't say no. Once it's delivered and put together, I'm sure I'll post some pictures. I'm currently on the hunt for a cute, but inexpensive rug to go under it, so if any of you know of ones send them my way! +Love my red Kate Spade crossbody bag that I always talk about?! I found this one (Rebecca Minkoff at that!) that I think you all need to buy. It's on sale for just over $100! Hoodies, leggings, animal hats...yes please. +Our stroller is currently en route to our house...I plan to share all about it in a future post! +Billy and his two guy friends (bless their hearts) started working in the nursery on the board and batten last night. We bought all the supplies last weekend and then last night they got ALL the wood pieces cut for it and placed, so now they just need to nail it all up! +I've cut back dramatically on my coffee drinking since being pregnant, but am allowing myself one per week. My doctor says a cup a day is fine, but I've also read differing opinions on it, so this is just the balance that I've found that has worked. I recently started asking the lovely ladies at Starbucks to make my drinks half decaf and you can't notice a difference at all! Give it a try fellow mom's to be! +At this time in exactly 2 weeks we will be on our way to Charleston to cross another city off our travel list! +This phone case is calling my name. There is nothing to hate about any of this, and for that I'm thankful. Make sure you enter the two giveaway's I've got going on right now: here and here! I LOVE that Rocky made the paper! So neat! That will be so fun to show the baby one day! Can't wait for the gender reveal! We have a Tom and Chee here. I need to go try it! Hope you have a great time in Charleston! I can't wait for our trip in September!!! 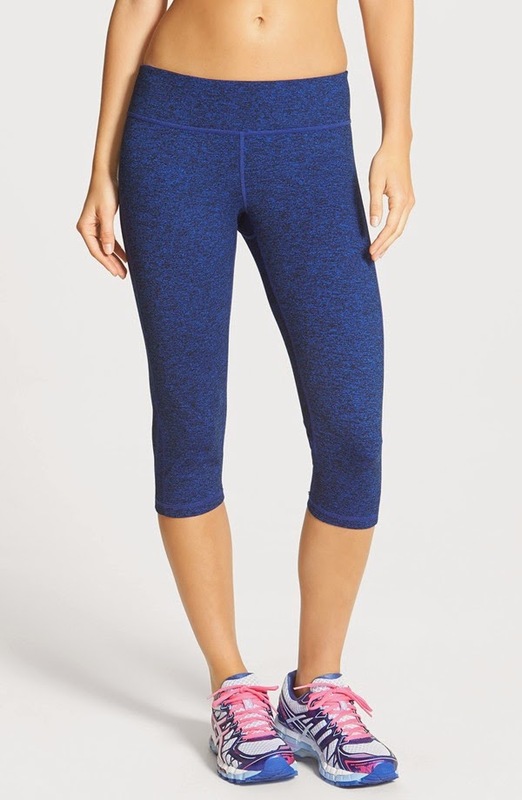 Oh, those capris look so comfy! I love that your puppy is famous!! How stinkin cool is that article?!?! That Tom and Chee place looks incredible. I swear we are so lucky in Columbus, we get the coolest restaurants. That grilled cheese with mac & cheese in it looks DELISH! I wish we had one of those around here. Can't wait to hear about baby's gender and your upcoming Charleston trip! You JUST got Tom + Chee?! Omg, isn't is amazing?! I love the pesto and turkey combo best! 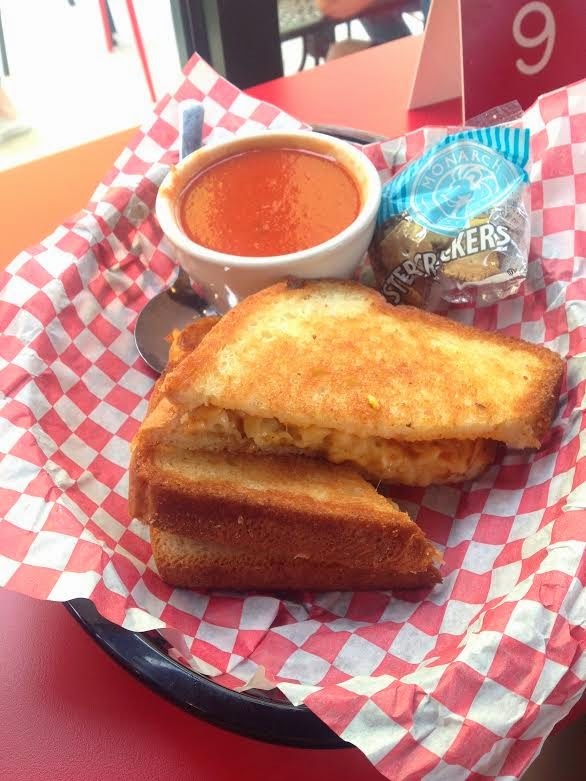 I don't know about the Mac & Cheese in the grilled cheese but, the grilled cheese & tomato soup does sound oh so good! At first I wasn't thrilled that our baby is due in early Feb because it would be so cold but, it will be so fun to be able to snuggle up & wrap him or her up in the adorable Winter outfits!! Speaking of, I die over that little hat! It is so cute!! I saw Tom + Chee on Shark Tank a couple of weeks ago! :-) I'm jealous - I love me some grilled cheese! Where did you find your patio furniture? We are currently looking for some as well and are looking for the sales coming up! So much exciting things going on for you- love hearing about it all!! I really want to try out Tom + Chee!! That mac & cheese grilled cheese looks like heaven! That's so awesome you guys were on the news and the Dispatch! I mean, Rocky does have some star quality I must say! Happy weekend to you! i need those work out pants pronto! I have been inspired to share my heart with Huntingtons Disease. Tom + Chee is everything that is right in the world! There are just so many good things going on for you friend and they all make me smile so big. That hat....I just can't wait to see sweet baby K in it. Love!!! Hope you are feeling great and have an amazing weekend. Oh my goodness that little baby hat is just precious!! Ok, so the hat is precious, but makes me think boy, like immediately! So my vote for Baby K is BOY! 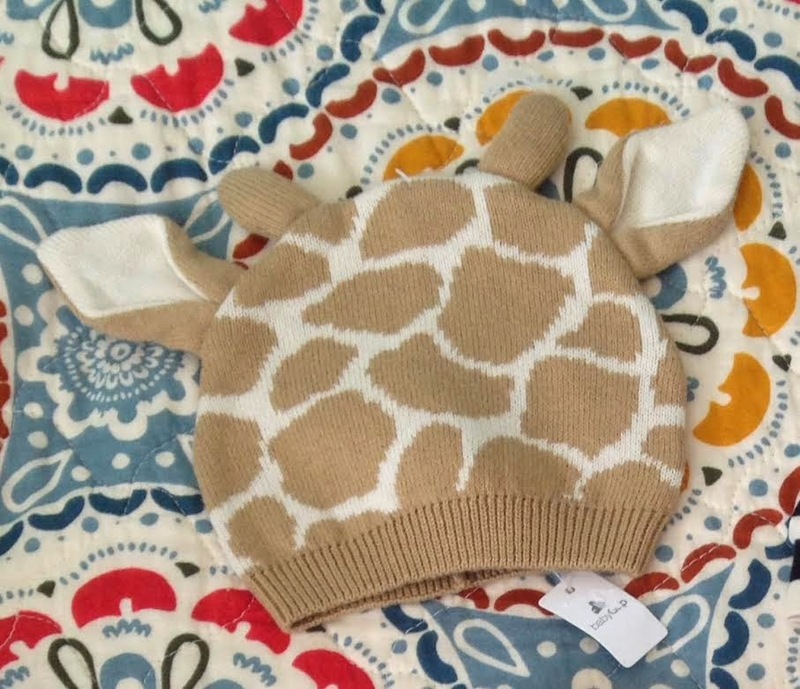 Dibs on the giraffe hat for future baby hand-me-downs!! :) haha SO CUTE! That is so cool that you are on the news! And super cute pictures! How awesome that you made the news, so exciting!!! Sounds like you have awesome things going on in your life!! !